The Trilogy Replenishing Night Cream is an easily absorbed night time moisturiser, serving to nourish and repair during sleep. A nourishing blend of bio-actives, it uses co-enzyme Q10 and Glycablend™ which assist the skin’s natural process of regeneration to restore elasticity, suppleness and smooth fine lines and wrinkles. Blueberry, Pomegranate and Strawberry Seed Oils are anti-ageing powerhouses. Abundant in antioxidants, they are a force against environmental stressors, helping to protect and keep skin youthful. Essential fatty acids diminish the appearance of wrinkles and provide a firmer and plumper looking complexion. 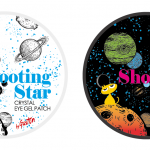 They are light, non-greasy, fast absorbing and moisturising, suitable for all skin types. Together, chia, blueberry, strawberry and pomegranate seed oils comprise what Trilogy calls its Glycablend™, a blend designed to fight glycation. Glycation is a natural process that causes collagen and elastin fibres to harden resulting in reduced elasticity. This happens naturally as we age. 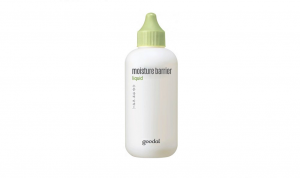 Glycablend™ is said to improve the skin’s texture, minimise the appearance of fine lines and wrinkles and restore radiance. Emollients are represented quite strongly in the formulation, helping to deliver replenishing and moisturising properties. Sweet Almond Oil, Cocoa Seed Butter and Chia Seed Oil are rich in fatty acids helping to lock in moisture and form a protective barrier whilst also breaking down sebum to keep pores clean. 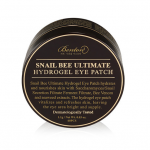 This makes them particularly useful against acne, eczema, dry skin, psoriasis and rosacea. The Glabridin in Licorice Root Extract soothes to help sensitive and reddened skin. 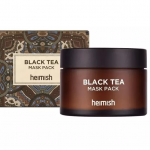 It also assists to manage melanin production in an effort to encourage even tone and reduce the appearance of dark spots. Similarly, Mulberry Root Extact has the ability to brighten and improve uneven skin tone. Collagen is vital to skin elasticity and firmness. Trilogy has added specific ingredients to the cream to address collagen support. Co-Enzyme Q10 (Ubiquinone) is naturally produced in the body, the amount declining with age. CoQ10 topically helps to reduce collagen breakdown. It also aids in the management of energy production in cells and may have anti-ageing effects by improving the epidermal (inner) skin layer and protecting against photoageing. Aloe Vera Leaf Juice is anti-inflammatory and packed with vitamins which protect skin from free radicals and premature ageing. Aloe vera can be absorbed up to 7 layers deep. 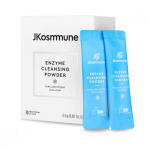 This combined with enzyme activity also helps to rejuvenate tissues to promote collagen production plus cleanse and detoxify for healthy pores and skin. A multi-benefit ingredient, it is additionally an effective humectant, proficient at water retention thus effective as a moisturising agent. Soybean Oil exhibits a small molecular structure for deep penetration, enabling it to stimulate elastin and collagen synthesis. It is rich in in Vitamin E, essential fatty acids and lecithin which benefit the skin when applied topically by encouraging healthy cell growth, protection and repair. Some botanicals are added purely for their soothing capability, contributing anti-inflammatory, antiseptic and antibacterial properties. Chamomile Flower Extract exhibits high flavonoid content which makes it able to soothe itchy, dry and reddened skin as well as improve suppleness. Marigold Flower Extract promotes healing and regeneration of skin. As such, it is often used to treat sunburns, rashes, insect bites, dryness, some forms of contact dermatitis and other mild skin irritations. Supporting the Glycablend™ is Green Tea Leaf Extract, well known for its antioxidant power and ability to protect skin from environmental stressors. This in turn helps to achieve better skin firmness and tightness. Although lesser in strength, Cucumber Fruit Extract also boosts antioxidant content. Evening Primrose Seed Oil contains a high level of Gamma-Linolenic Acid (GLA), giving it anti-inflammatory properties to soothe skin and keep it hydrated. It is useful for treating conditions such as eczema, psoriasis, dermatitis and sunburn and is particularly good for acne as it works without clogging pores. Marula, Avocado and Olive Oils are rich in essential fatty acids delivering more healing effects to the formulation and helping to smooth, lubricate and hydrate skin. Sodium Hyaluronate (Hyaluronic Acid) is comprised of small molecules that easily penetrate the skin and can hold up to 1000 times their weight in water, to boost hydration and elasticity. The component of the formulation found at the highest concentration after water is Coco-Caprylate, a 100% natural ingredient which comprises an ester of coconut fatty alcohol, caprylic acid and capric acid. With strong emollient characteristics, it is included to enhance hydration whilst also improving product slip, spreadability and achieving a non-greasy after feel. It is an alternative to silicones. Being highly compatible with skin, it is well absorbed and tolerated. Other ingredients are added for fragrance, preservative function, texture or pH adjustment. 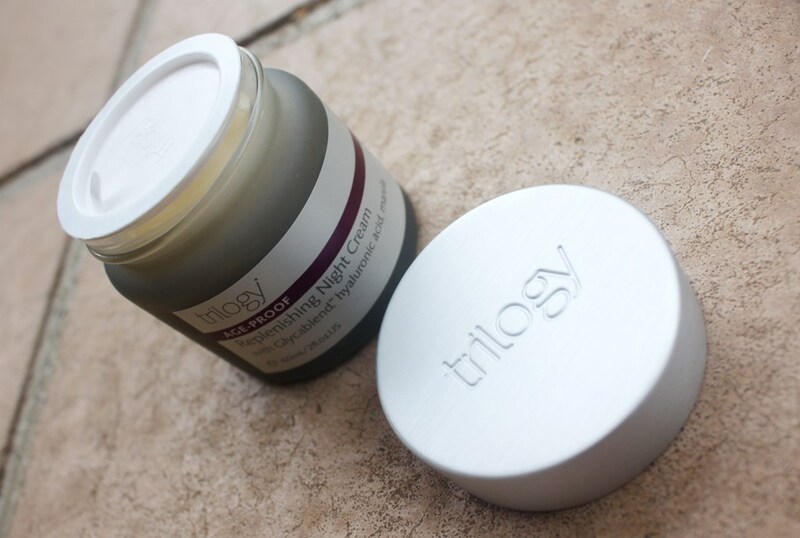 The Trilogy Replenishing Night Cream comes in a frosted glass jar with protective inner cap and screw top lid as well as a dispensing spatula. 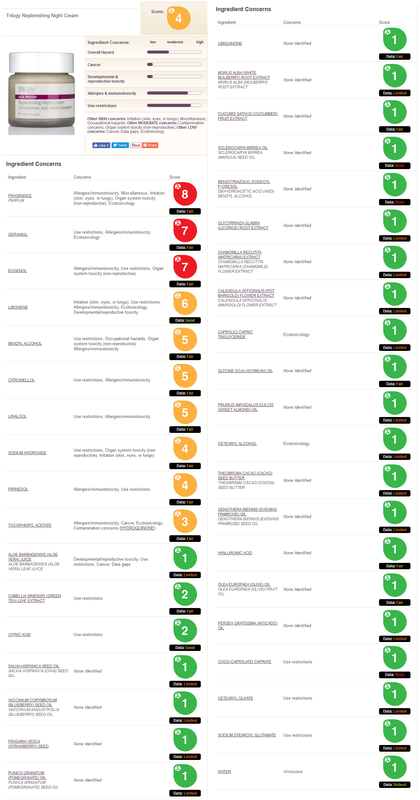 The analysis proves relatively clean, in both the CosDNA and EWG reports with the exception of anticipated warning flags raised against the several added fragrances and preservatives (know irritants). 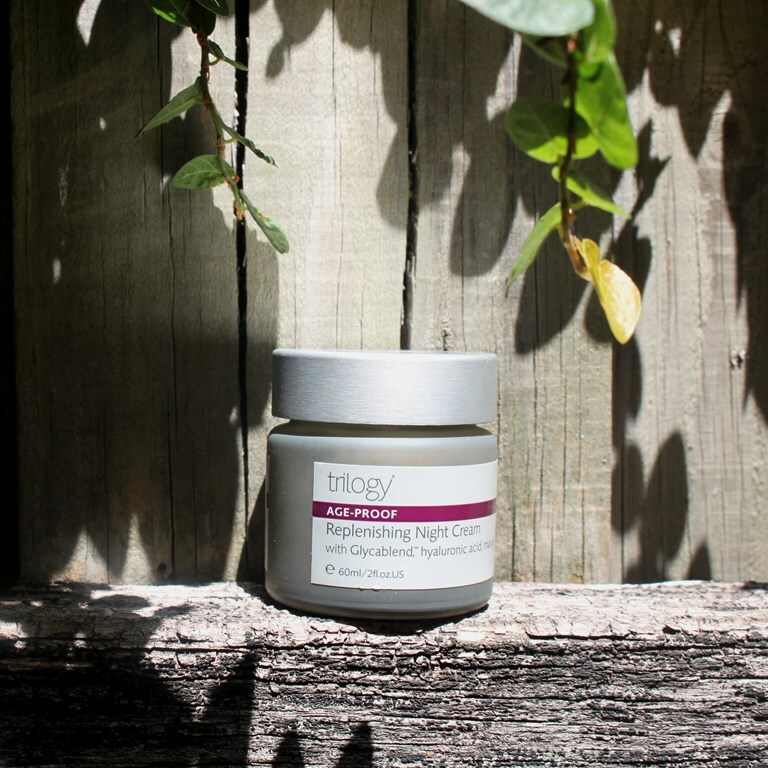 The Trilogy Replenishing Night Cream has a fresh citrus like scent that reminds me of a citronella candle. 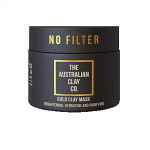 A 60ml jar of the Trilogy Replenishing Night Cream costs approximately AUD$56.95. 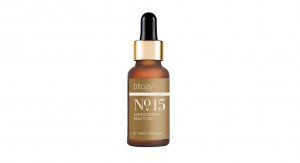 Trilogy products can be procured from the company website as well as from pharmacies and Myer Department Store. The product has a shelf life of three years and expiry of 6 months after opening. 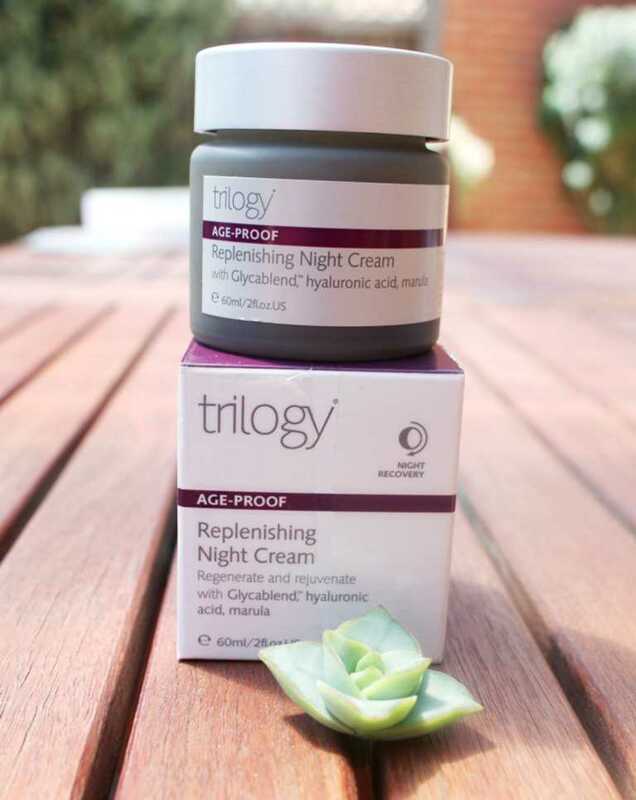 The Trilogy Replenishing Night Cream is part of the Age Proof line which uses botanical actives to replenish ageing skin. More specifically, this range highlights the use of Glycablend™, a combination of chia, blueberry, strawberry and pomegranate seed oils said to fight the natural process of glycation. As we age, glycation compromises collage and elastin fibres thus reducing skin elasticity. The cream is presented in a glass screw top jar with protective inner cap and spatula. A pump action dispenser would be more hygienic and cause less degradation of botanical actives over time due to light and air exposure. Perhaps this is why the cream has only a 6 month shelf life after opening. So although it may not harbour bacteria, it will probably lose effectiveness over time so best to continue use until it is finished. The spatula does prevent the temptation to dig in with your fingers and limit the risk of contamination. 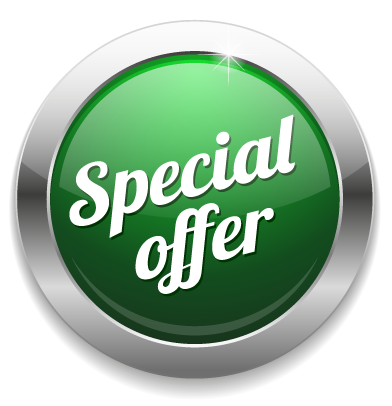 It is reasonably priced given the tiny amount required per application which should see the cream last the full 6 months. The cream is glossy in texture with a lot of slip in application. Only a small amount is needed to cover the entire face and neck, over-applying causing a film of oiliness. 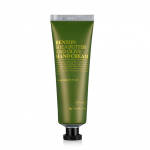 It is quickly absorbed, melting into the skin to leave it feeling instantly moisturised. It has a scent that disperses after the product sinks in. 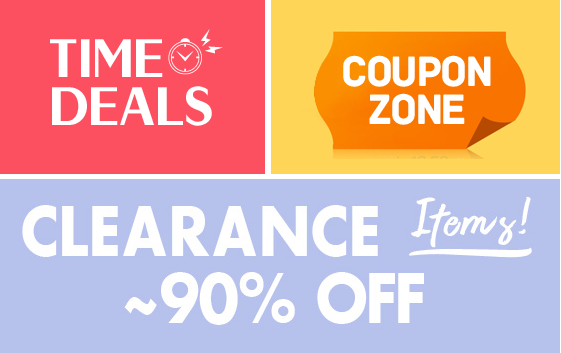 A citrus scent is the result of the added fragrances. No less than 7 ingredients are added for fragrance alone. 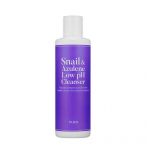 It is a pleasant scent but I take my usual stance and wonder why there is a need for it since it does not improve the efficacy of the product and may introduce irritation to those with sensitive skin. 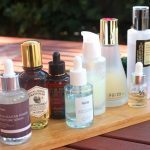 I understand that a skincare product should not just be a topical experience and that all sensory aspects are important, but adding potential irritants for fragrance is something I continue to question. Personally, I had no reaction to the cream or its scent at any time. The cream feels occlusive once applied, locking in that moisture. 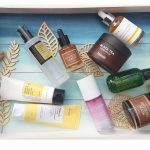 Although I don’t see any ingredients that would cause problems with an a.m. application, it is simply too heavy for comfortable use during the day, particularly when layering sunscreen or makeup. For evening however, it feels right and even a little luxurious without any greasiness. 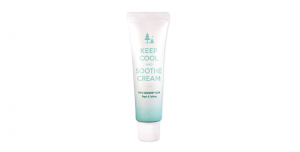 Given it is designed for overnight recovery, it not surprising that it weighs in a little heavier than a day cream. I have been using it for a couple of months now and enjoying it. Even in the summer, it doesn’t usually feel too heavy on my combination skin type although it’s not comfortable during overly hot or humid nights. Reflecting on the manufacturer’s anti-ageing claims… well Glycablend™ is a potent hit of antioxidants which are a skin saviour, helping to repair and prevents cell damage. The components of the blend are listed directly beneath some hefty emollients which deliver the moisturising properties to the cream. Then comes Co-Enzyme Q10 to strengthen collagen fibres and stop it degrading followed by an impressive list of natural extracts and moisturising oils that act without clogging pores. So, the ingredients and their perceived concentrations certainly support the claim of overnight repair and nourishment. In practice, I would agree that this cream achieves its objectives. 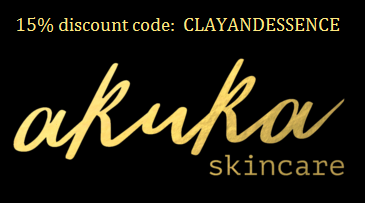 My skin feels soft and supple in the morning. Even my ever present oily T-zone is quite balanced which is refreshing. It’s hard to confirm whether lines look less prominent, but my skin does have an overall healthier appearance in the morning, less dull and more plump than would otherwise be the case. If I was being particularly picky, the only slight criticism I have is that my often very dry jaw line might be a little under hydrated and in need of a boost from an added serum. The rest of my face and neck is well cared for by this cream. I anticipate good things from a cream packed with so many botanical extracts and few fillers. 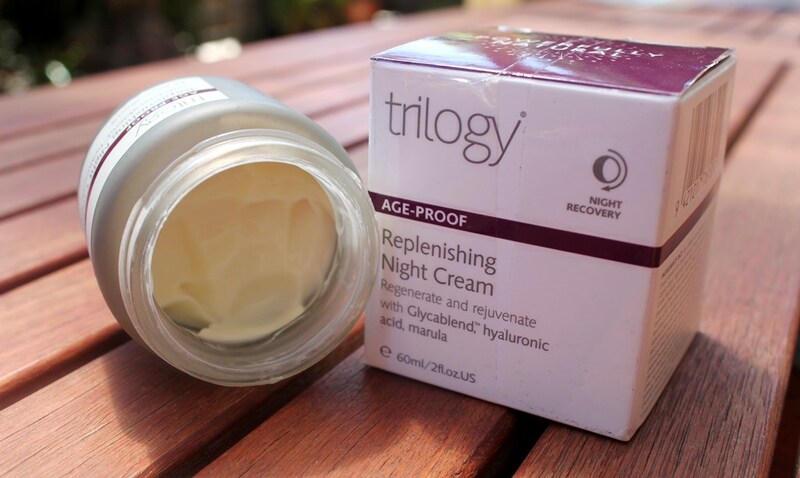 Thankfully, the Trilogy Replenishing Night Cream didn’t disappoint. 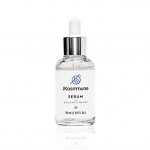 With the addition of a serum or moisturising treatment preceding its application to target overly dry areas, it delivers a wonderful hydrating, repairing and strengthening skin experience.